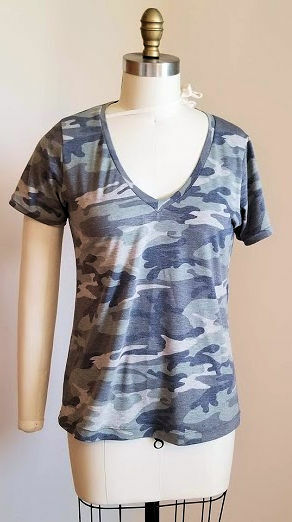 It seems like forever ago that I mentioned I was going to sew up the Union St. Tee – while I was really excited to sew this up, I put it on the back burner because I was too lazy to change out my serger thread! Over the weekend I finally tackled this project and have to say, I’m sort of disappointed that this pattern isn’t really much different than anything else I own. While there isn’t anything wrong with the design, I’m fairly certain that one of the other 4 or 5 patterns that I own would have worked just as well. This particular design is a bit less fitted, but I found that the arms are a bit too snug for my liking. Putting this together was pretty straightforward. I didn’t really use the directions until it came to the V-neck assembly… overall I thought that section was very well written – so much so that I know a beginner could do it and should have a pretty good looking neckline! The bottom line: If you already own a great t-shirt pattern, chances are you won’t need this one. If not, I’ll go ahead and recommend this one because the v-neck instructions are well put together. With all that said, I’ll probably give the long sleeved version a whirl since this pattern is ready to go and I have some fabric that needs to be used! This entry was posted in Uncategorized on November 13, 2018 by stacy.